2pcs Aluminium heat press plates,upper plates,120*80*45mm,down plates 120*80*40mm 110V US plug temperature control box,0-415F Both upper and down plates are available to heat up. The screw diameter is 8mm,could be screwed on tightly. Heat plates are made by aluminium,light but heavy duty use heating.
. Why it is useful for heavy duty rosin press. Because the plates are made by aluminium,it is 40mm thickness,the normal one is only 15mm. 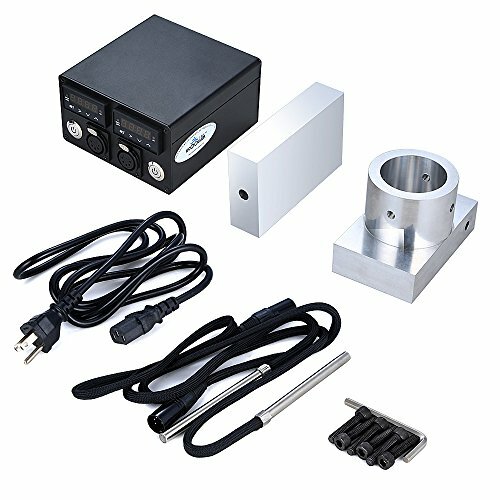 It is compatible for 8000psi or more big pressure machine DIY rosin press kits,include the wires,temperature control box,both heat plates are able to be heating up. The rosin press plates are used for manual ,hydraulic and pneumatic rosin press 40mm thickness 6061Aluminium Four Points to Make Rosin. 1.Choose The Starting Plant Material.Better to choose the enough trichomes or crystals material. 2. Applying Intense Force.Quick clam fits the need of rosin tek. 3. The Right Temperature.Rosin is pressed with temperatures from 170F to 300F, with most target temperatures around 200F. At temperatures above 315F you begin to degrade the psychoactive chemicals. 4. Length of Time.Press the plant material and watch the extract seeping out of the plates onto the parchment,the length of the time is very important. If you have any questions about this product by chipman, contact us by completing and submitting the form below. If you are looking for a specif part number, please include it with your message.